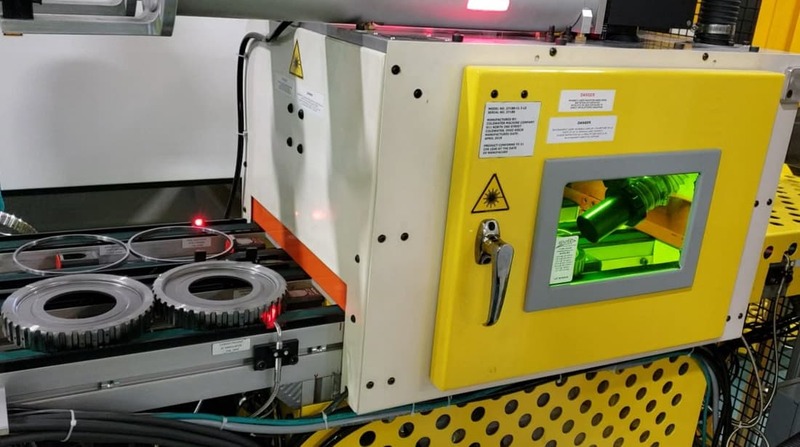 Coldwater Machine Company, a leading engineering solutions company that manufactures and integrates assembly automation and special machines, has announced its laser ablation system design and build capability. Based on Coldwater Machine standards that are adapted for specific requirements, the systems can be designed to stand-alone or for integration into any manufacturing process that requires cleaning of parts prior to another operation. Laser ablation can serve as a good alternative to traditional surface finishing solutions. As compared to grinding, lasers create a cleaner, smoother surface by eliminating burrs and nicks without increasing surface roughness. And, compared to fluid washers laser ablations stations typically have a significantly smaller footprint, require fewer components and are easier to maintain. In Coldwater’s most recent application, the company integrated a 3-ft x 3-ft. laser ablation station around existing automation within a laser welding cell. In this instance, the components for cleaning travel on a conveyor into a Class 1 laser enclosure with glass specifically tinted for viewing of laser processes. The door then comes down to enclose the part and shield the light emitted from the 100W laser. Situated on a servo-driven powered slide unit, the part is raised up and rotated 360-degrees to ensure that any dust, oil, coolant, debris, etc. is removed from all sides.